As I was driving through San Geronimo Friday, I was reminded of the days when I covered Sheriff’s Calls for The Point Reyes Light. Every couple of years, some motorist would notify sheriff’s deputies he had been driving past the San Geronimo Valley Golf Course when his car was hit by a golf ball. Last week, it finally happened to me. The ball came off a fairway south of Sir Francis Drake Boulevard, bounced on the shoulder, and then off the hood of my car. It didn’t do any damage; however, it felt like a rite of passage: somewhat akin to Bolinas and Stinson Beach motorists being inducted into the Lagoon Club — but without all the mess. Immediately I knew how I would begin this week’s blog entry, but what I didn’t figure on is what would happen next. Helping keep this blog online is computer technician Keith Matthews of Point Reyes Station, and for Christmas he gave me his copy of the Morris Dictionary of Word and Phrase Origins. Matthews said he’d spent the last year working his way through the dictionary and thought I too might find it interesting. I already have. As it happened, when I opened the dictionary, the first word my eye fell upon was “halcyon.” Although I seldom use the word, I have occasionally quipped about “the halcyon days of yore” in referring to mellower times, but I knew nothing about the word’s origin. It turns out, “halcyon” has had particularly ironic meaning for West Marin these the past few weeks. 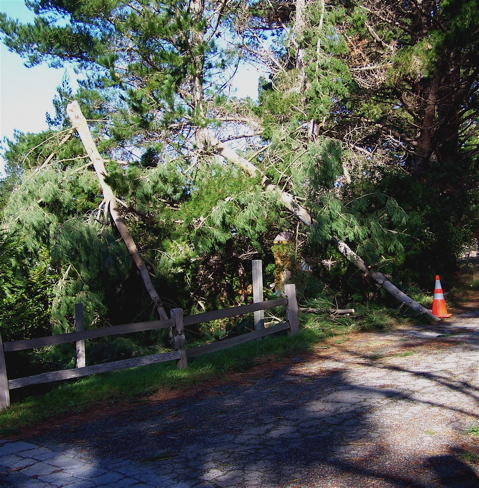 Tuesday evening after this week’s storm had caused a several-hour blackout, I mentioned to Nina Howard of Point Reyes Station that the foul weather ran afoul of the original meaning of halcyon. I explained about the Greeks believing the kingfisher’s nest floated on the ocean and, therefore, needed calm weather to get through the brooding that supposedly occurred at this time of year. “Well, so much for that theory,” remarked Nina. Waking Wednesday from the night’s heavy rains, high winds, and several-hour-long blackouts, I looked out on my deck Wednesday morning to see if the storm had caused any damage. What I saw was a big pot bust. 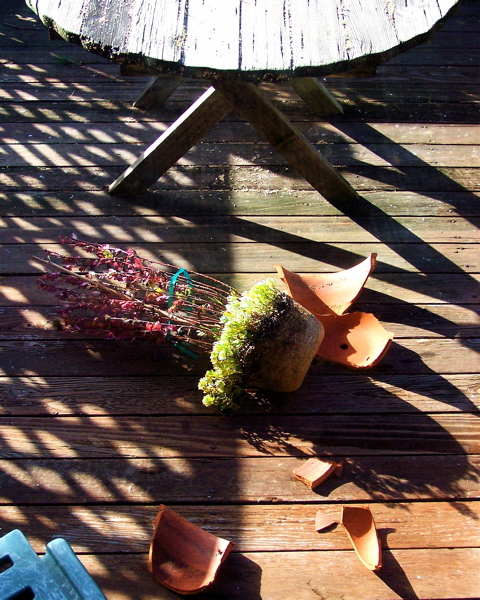 Indeed, lying busted up on my deck was a heavy, terra cotta flowerpot that had blown off my picnic table. A root ball from the chrysanthemums and ice plant growing in it was still intact, and later in the day I was able to find another large pot at Toby’s Feed Barn and replant the flowers. Predictably, the most noticeable damage I spotted around my property was not to my flowerpot. On the way into town, I discovered a massive limb had broken off one of the pines of my neighbors, and part of the tree was sticking into Campolindo Drive. Someone had stuck orange traffic cones around it, giving maintenance of our private road a sort of Public Works Department ambiance. What got me out of my cabin before showering and shaving Wednesday morning, however, was not finding a replacement for my broken flowerpot. Two friends called to say that Manka’s had caught fire during the night and was still burning. Owner Margaret Grade is a long-time friend, so I immediately headed for Inverness to see what was happening to her restaurant. That story follows. Dave, You could have fooled me. Sorry to learn of the broken pot; busts are always interesting news. OK you got me! Very funny! Sparsely Sage and Timely is powered by	WordPress 4.9.10 and delivered to you in 0.255 seconds using 52 queries.